In the days of the early Republic, the U.S. Army suffered some of its most devastating defeats in its history. While the Continental Army of the War for Independence fared well against the European style of tactics employed by the British redcoats, particularly later in the war, the Indian warriors along the American frontier confounded many of the early Republic’s senior officers. Two separate expeditions into the Northwest Territory, led by BG Josiah Harmer and MG Arthur St. Clair, were ambushed and nearly destroyed by Indians, primarily from the Miami tribe, with covert British support. This period represented some of the darkest days in the history of the U.S. Army. Eventually, one senior American officer emerged to lead the Army to victory and end much of the threat posed to American settlers northwest of the Ohio River. MG Anthony Wayne, who had already established himself as one of the premier American officers in the Continental Army, was given command of the Army and led it once again into Indian Territory. Under Wayne’s leadership, however, the results were much different. At the Battle of Fallen Timbers in August 1794, near present day Toledo, Ohio, Wayne and his combined force of regulars and mounted Kentucky militia, routed the Indians and largely eliminated the Indian threat in the Northwest Territory. Anthony Wayne was born 1 January 1745 in Chester County, Pennsylvania. The only son of Isaac and Elizabeth Wayne, Anthony, at the age of sixteen, was sent to a private academy in Philadelphia run by his uncle. While at the academy, young Anthony never seemed to approach his classroom studies with the same enthusiasm as the mock battles he fought with his classmates. At that time, much of the American frontier was under constant threat of Indian attack as the French and Indian War raged over much of northeastern North America, and Wayne, like many boys his age, found the stories of Indian warfare much more exciting than academics. After leaving school, Wayne was briefly employed as a surveyor before returning to his family’s estate to take charge of the tannery. He took over the family business after the death of his father in 1774 and made it profitable. Before hostilities broke out between the colonies and England, Wayne was active in local protests against the coercive acts of the British government. In 1774, he represented Chester County in the Pennsylvania legislature and later served on the Committee of Public Safety. After war broke out, Wayne resigned his seat to raise a regiment of volunteers. In January 1776, he was appointed by Congress to command the 4th Pennsylvania Battalion and given the rank of colonel. Despite a lack of formal military training, Wayne became one of the finest officers in the Continental Army. Wayne’s first combat experience came when he and the Pennsylvania Brigade were sent to bolster the faltering American expedition in Canada. When the Pennsylvanians met the remnants of MG Richard Montgomery’s army, they were sent down the St. Lawrence to attack what was thought to be the advance guard of the British forces marching against the American army. Making contact with the enemy at Trois Rivieres (Three Rivers) on 8 June 1776, the Americans soon discovered they were facing the main British force. During the engagement, in which Wayne was wounded, Wayne’s battalion covered the retreat of the rest of the American force. After the Americans withdrew from Canada, Wayne was given command of the garrison at Fort Ticonderoga. On 21 February 1777 Wayne was promoted to brigadier general and given command of the Pennsylvania Line, which he commanded at Brandywine Creek on 11 September 1777. 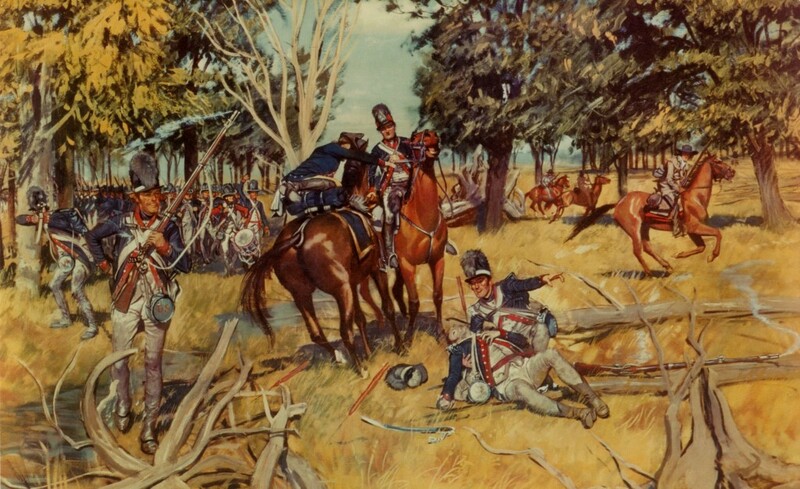 Two weeks later, however, Wayne’s troops were surprised by the British in their encampment at Paoli. In a night attack, the British bayoneted hundreds of Continentals in one of the most devastating defeats of the war. Wayne was accused of negligence in this action. He demanded a trial by court-martial and was eventually acquitted. In October of 1777, Wayne fought with distinction at Germantown and suffered a slight wound. He then endured the harsh winter of 1777-78 at Valley Forge. At the battle of Monmouth in late June 1778, Wayne’s Pennsylvanians led the initial attack and defended the American center against the British counterattack. On 16 July of the following year, Wayne won fame for leading a daring nighttime bayonet assault against the British position at Stony Point, New York. Upon receiving orders for the attack, Wayne replied to GEN George Washington, “General, if you give me permission, I’ll storm Hell itself for you.” The attack captured the surprised British garrison and helped to relieve pressure on West Point. For this daring assault, and coupled with his tremendous temper and intensity in battle, Wayne earned the nickname “Mad Anthony.” Congress later awarded Wayne a gold medal for the capture of Stony Point. When BG Benedict Arnold’s treason became known in late September 1780, Wayne rushed to West Point to defend it from the British. In January 1781, he quelled the mutiny of the Pennsylvania Line. As the focus of the war moved south, Wayne served under the command of the Marquis de Lafayette in Virginia. While serving with Lafayette’s army, Wayne ran into a much larger British force at Green Spring and narrowly avoided a disastrous defeat. Wayne was also slightly wounded in the thigh in Virginia when a jittery sentry fired at him and hit him with buckshot. He later served at the decisive battle at Yorktown and was present for Cornwallis’ surrender. In 1782, Wayne was detached to MG Nathanael Greene’s army and fought a successful campaign against Creek and Cherokee Indians in Georgia. On 30 September 1783, Wayne was brevetted a major general. Less than two months later, however, he retired from the Army. He took up farming and dabbled in politics, being elected to the Pennsylvania General Assembly in 1784. He later moved to Georgia and was elected the state’s representative in Congress in 1790, only to have his seat declared vacant the following year due to election fraud. While Wayne’s career in politics was relatively short-lived and tumultuous, his military career would soon be reborn. Disastrous events in the Northwest Territory required the federal government to re-examine its military policies and place someone in command to rectify the situation. After scrutinizing a number of candidates for the job, the War Department eventually selected Wayne, and he answered his nation’s call once again. After the conclusion of the War for Independence with the signing of the Treaty of Paris on 3 September 1783, the U.S. Army faced tough times. On 2 November 1783, Congress ordered the Army to disband, although this initial order was not carried out. In December of that same year, GEN George Washington bade farewell to his officers in New York City and resigned his commission as commander-in-chief, leaving the Army without a strong leader. On 2 June 1784, Congress again ordered the disbanding of the Army, stating that “standing armies in time of peace are inconsistent with the principles of republican government, dangerous to the liberties of a free people, and generally converted into destructive engines for establishing despotism.” While most of the Army was disbanded, Congress kept a caretaker force of eighty artillerymen. The following day, however, Congress authorized the raising of 700 men to form a regiment of eight companies of infantry and two companies of artillery, primarily to man western frontier posts. This regiment became known as the First American Regiment (the present day 3d Infantry Regiment, “The Old Guard,” traces its lineage to the First American Regiment). During the 1780s, apart from a few domestic disturbances such as Shay’s rebellion in 1786, the primary threat to American security and to settlers attempting to establish new homesteads west of the Alleghenies were Indians. The Indians, including Miamis, Shawnees, and warriors from other tribes, did have assistance in the form of British agents from Canada, who encouraged the Indians to attack American settlers. Some British officials even hoped to establish an “independent” Indian state between the Ohio River and the Great Lakes, a state that would actually be a British puppet state. Furthermore, British troops still occupied several forts in the Northwest Territory they deemed essential to the fur trade, in violation of the treaty that officially ended the war with Britain. In an attempt to crush the Indians attacking American settlers, the federal government, under the direction of President George Washington, ordered military expeditions into what is now Ohio. The first of these expeditions, led by BG Josiah Harmar, consisted of an expanded First American Regiment and 1, 500 militiamen from Kentucky and Pennsylvania. Setting off from Fort Washington, near present day Cincinnati, Harmar’s force headed north towards the Miami Villages. Almost immediately, Harmar ran into problems, especially with supplies and integrating the militia into his force. Furthermore, while deep in Indian territory, Harmar divided his column, significantly weakening his army. The Indians, led by the Miami’s Little Turtle, attacked Harmar’s troops on 19 and 22 October at the confluence of the St. Mary and St. Joseph Rivers and inflicted heavy casualties on Harmar’s militia and regulars. Harmar was forced to retreat back to Fort Washington, and the rout of Harmar’s expedition only served to embolden the Indian warriors. Another expedition was organized to march into the Northwest Territory to once again deal with the threat posed by MG Arthur St. Clair, the governor of the Northwest Territory and veteran of the Continental Army. In addition to the First American Regiment, a second regiment of infantry had been raised and would accompany the expedition. Kentucky militiamen and a few cavalrymen brought St. Clair’s army up to approximately 1,400 men. St. Clair, who was ill and not really fit to command the force, began marching his army north from Fort Washington on 17 September 1791. The march progressed slowly — by November, the expedition was only ninety miles from where it started. St. Clair weakened his force by detaching the First Regiment to find his overdue supply train. On 4 November, Indians led by Little Turtle surprised and attacked the expedition along the upper Wabash River. In the ensuing battle, St. Clair’s force was completely routed. The Indians slaughtered over 600 men, along with a large number of civilians accompanying the expedition. The wounded left on the battlefield were mercilessly scalped by the Indians. St. Clair ordered a full retreat and the remaining troops limped back to Fort Washington. St. Clair’s defeat demonstrated that major reforms were required if there was any hope of making the Army an effective fighting force against the Indians, or any other potential enemy of the young republic. Moreover, the Army needed a commander who could lead the Army and end the devastating string of defeats it had experienced at the hands of the Indians. Congress agreed to a reorganization of the Army. As far back as 1784, MG Baron Friedrich Wilhelm von Steuben, who had done much to train the Continental Army, had advocated a legion form of organization. On 5 March 1792, Congress approved the reorganization of the Army as the Legion of the United States. The Army would be divided into four sublegions of 1,280 men, each commanded by a brigadier general and comprised of two battalions of infantry, one battalion of riflemen, one company of artillery, and one company of dragoons. It was believed that this reorganization would provide better tactical flexibility on the battlefield. Referring to the Army as the “Legion” also had a sentimental purpose, as the leaders of the young American republic often drew parallels to the Roman Republic. To lead the reorganized Army, President Washington and Secretary of War Henry Knox examined several candidates, including Henry “Light Horse Harry” Lee and Daniel Morgan, but it soon became clear there was only one obvious choice: Anthony Wayne. On the same day the Army reorganization was approved, Wayne was promoted to major general and named commanding general of the Legion of the United States. As commander of the U.S. Army, in the form of the Legion, Wayne was provided significant time to train the soldiers under his command and put his personal stamp on the Army. For nearly two years, American delegates attempted to negotiate with the Indians, all to to no avail. Once again, American troops would have to face hostile Indians. This time, however, they would be ready for the task at hand. Originally, Wayne began training the Legion at Fort Fayette, near the frontier town of Pittsburgh. Pittsburgh, however, like many frontier towns of the period, thrived with vice–Wayne called it “a frontier Gomorah.” He therefore moved his troops twenty-two miles down the Ohio to a place he named Legionville. At this site, Wayne implemented a rigorous training program for the Legion. At Legionville, Wayne instilled discipline in his inexperienced troops. Secretary Knox had stated that “another conflict with raw recruits is to be avoided at all means.” Wayne needed little encouragement. 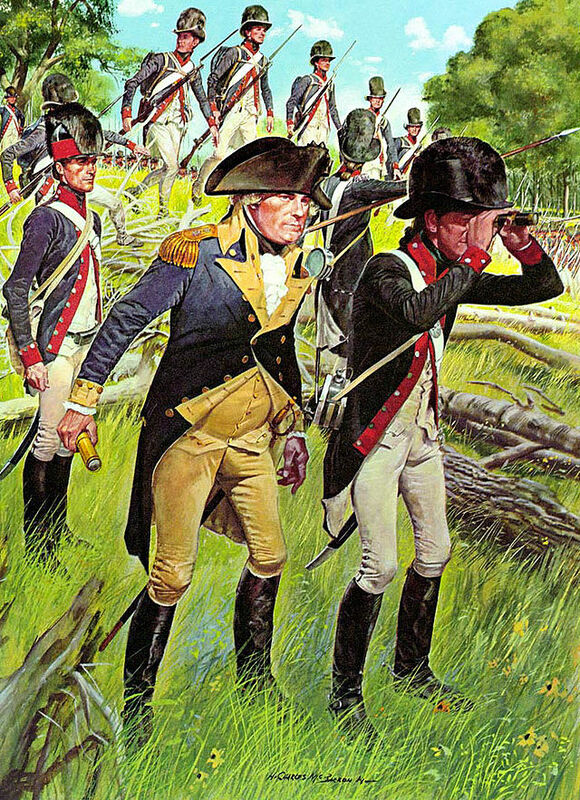 He immediately provided all of his officers down to company-level with copies of von Steuben’s Blue Book drill manual and instructed them to use it until the Legion was familiar with close-order drill, which hopefully would prevent the troops from breaking and running on the battlefield. He instructed the men on the art of field fortifications; the troops learned to build redoubts and abatis to protect their encampments. The troops of the Legion learned to handle their muskets and use bayonets. Even more important, Wayne stressed the importance of individual marksmanship, something that Army had neglected because of the high cost of powder. In an attempt to increase esprit de corps, Wayne decided to give each sublegion distinctive colors for cap ornaments and uniform facings: white for the First Sublegion, red for the Second, yellow for the Third, and green for the Fourth. With the Legion trained, Wayne loaded his forces and floated them down the Ohio to Cincinnati and Fort Washington. Wayne then received some disheartening news. Secretary Knox informed him that recruitments lagged, forcing him to round his forces with Kentucky militia. Wayne, like many regulars, had little confidence in militia. On a personal note, he also received news that his wife had died. With his force near full strength, he marched north and established a new encampment, Fort Greene, named for Nathanael Greene. On 25 December 1793, an advance party arrived at the scene where St. Clair’s force had been massacred. They found a horrifying scene as hundreds of skeletons lay scattered about. On the site, Wayne’s forces established a new post, Fort Recovery, where some troops stayed for the winter, while the rest remained encamped at Fort Greene. By the spring of 1794, the Legion was ready to move. Reinforced by over 1,000 mounted Kentucky militia under the command of BG Charles Scott, Wayne advanced north, stopping to establish a string of forts along the way, including Fort Defiance, Fort Adams, and Fort Deposit. By August 1794, Wayne and the Legion had reached northwestern Ohio and the Maumee River, the stronghold of Indian forces and close to Fort Miamis, a British held fort in violation of the Treaty of Paris. Indian warriors, however, were waiting, ready to inflict another devastating defeat on invading troops. The Indians, under the overall command of Shawnee Chief Blue Jacket, hoped to ambush Wayne’s force at a site near present-day Toledo. The site was a clearing formed when a tornado years before had toppled hundreds of trees. This place, known as Fallen Timbers, presented excellent defensive positions that would not offer clear fields of fire for the attackers. Despite this, Wayne’s forces were much better trained than those that had fought the Indians in years past. In addition, Wayne had excellent scouts, which would prevent any likelihood of an ambush. On the morning of 20 August, the Legion approached Falling Timbers. Wayne divided his infantry into two wings, the right commanded by BG James Wilkinson, the other by COL John Hamtramck. A brigade of mounted Kentuckians guarded the open left flank, while the Legion’s cavalry secured the right along the Maumee. Scott’s remaining forces formed a reserve. The vanguard of the Legion came under fire around 0900. After some initial confusion, Wilkinson regained control of the situation. Wayne then rode forward, his eyes flashing. He correctly determined the strength of the enemy and their positions, and quickly saw that mounted troops would be largely ineffective on the battlefield. Under fire and in intense pain from gout, he immediately ordered his infantry to charge with bayonets to flush the Indians out of their positions, where they could be cut down by musket fire. Unused to a well disciplined enemy, the Indians, who expected to be the ones charging, broke and ran towards Fort Miamis. The Indians fled so fast that mounted troops on the flanks had difficulty catching them. Nonetheless, dragoons from the Legion charged headlong at the log barriers like jockeys at a steeplechase, cutting down the Indian warriors with their sabers. The dragoons’ charge completed the rout. The battle lasted less than an hour and proved decisive. Wayne lost less than forty killed and approximately 100 wounded. The British at Fort Miamis refused to admit their allies, and the British garrison made all efforts not to provoke a war with the Americans Wayne then destroyed Indian villages and crops nearby. Within three months, the United States signed a treaty with Britain that pledged their evacuation from the Northwest Territory forts by 1796. The following year, Wayne negotiated the Treaty of Greenville with the Indians, effectively opening Ohio to American settlers.